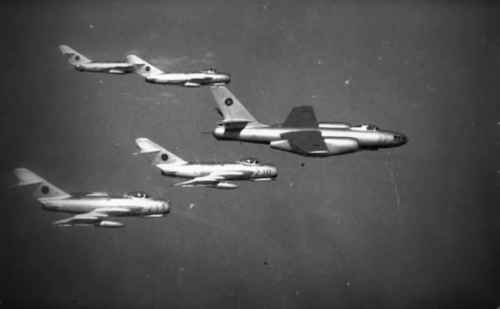 Albania the new ally of China, in 1962, 12 Shenyang F-5s fighters shipped to Albania. The Shenyang F-5 is a Chinese copy of the Mikoyan- Gurevich MiG-17F Fresco-C. The MiG-19PMs only six years operating from Rinas air base, the aircraft were shipped to China in exchange for 12 F-6 examples 1964-ben, presumably because the Chinese required the radars and wanted to glean what they could about current Soviet manufacturing techniques for the type. 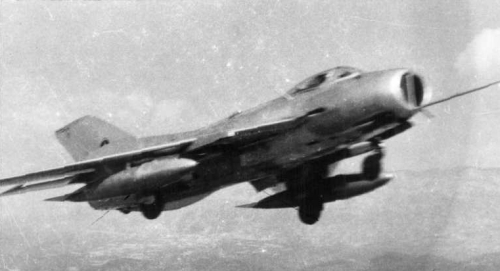 After swapping the 12 MiG-19PMs in 1964 for a similar number of Shenyang F-6s, more followed in subsequent years, and by 1968 the Albanian Air Force flying approximately 4 squadrons of these reverse-engineered MiG-19s. 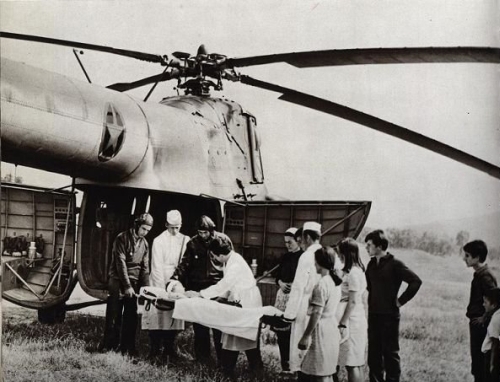 The developing Albanian Air Force received its first rotary-wing equipment in 1957 in the form of three Mil Mi-1 hares and four Mi-4 Hounds with three further examples of the latter arriving a year; one of each type was subsequently lost in a accidents. It was to be another ten years before this small fleet increased in size, when no less than 30 Chinese-built Mi-4s, known as Harbin Z-5s, were delivered. Most of these have survived and equip the sole helicopter regiment based at Farkë. Among their task is that of emergency supply flights during the winter to communities living in the mountains, as well as SAR and transport missions. Thirteen Harbin Y-5 (Chinese copy of Antonov An-2) delivered in 1963/64. 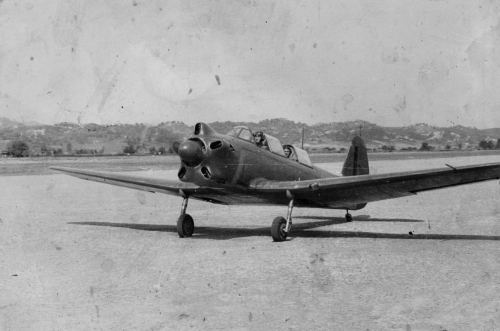 Used by No.1 Squadron of 4050 Regiment at Tiranë Aerodrome. Used for light transport and internal communications duties, but mainly employed on crop dusting work. The main task of these ageing biplanes is agricultural flying, the pilots averaging some 80 hours per year on crop dusting work. One Soviet-built Il-14M delivered in 1957, with luxury VIP interior. Personal transport of President Hoxha, based at Tiranë. Vlorë, on the Mediterranean Sea coast, has housed the Air Force Troop School since May 1962. 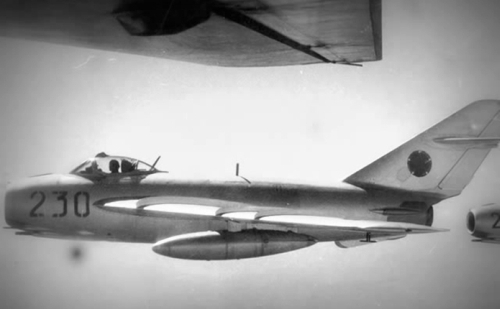 Pilots would spend their first year of officer training there before going on to the Nanchnag PT-6 in their second year for basic training, and finaly, if judged good enough, converting to jets on the MiG-15UTI. 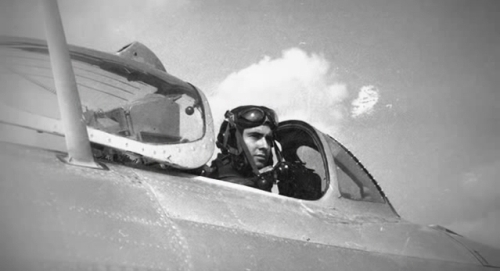 Once the new fighter pilots gained his wings, he would be posted to on of other Chinese fighter bases at Gjadër, Kucovë or Tiranë-Rinas to fly the Shenyang F-5 or Shenyang F-6 as a pilot 2nd Class.